Do you have rounded shoulders or a forward tilting head? Perhaps you are just, in general, a “sloucher”. Unfortunately, poor posture is a very common problem. So if you can say yes to these questions above you are definitely not alone. The good news is that you can fix your posture, but the bad news is that it takes time and effort. Basically, you want to focus on doing several things to improve your posture as there often is no single reason for how you got it. There is probably also not going to be “one thing” you can do that will fix it. But since we spend a whole lot of time sleeping every day, why don’t take advantage of that and think about how you can use that time efficiently. Often overlooked, the posture we have when we sleep does make a big difference and a few tweaks could go a long way. Another often overlooked thing is how we sit, which you can read more about here. When we are talking about sleeping on the bed, both the mattress you sleep on and the pillow you use are important. In general, you don’t want a mattress that is either too hard or too soft. Think about the spine and how it is shaped with minor curves when it is in a neutral position. Ideally, your mattress needs to be able to support that. Obviously, people have different preferences when it comes to the mattress they want to sleep on, and there is probably a good range of mattresses that is anywhere from medium soft to medium hard that will do alright. Another thing is that if your mattress is getting very old (10+ years) you might want to consider if it is still doing a good job at supporting you. Is Your Pillow Pushing Your Head Forward? A big soft pillow might feel great, but if your head is being pushed forward it is not a good thing and it could actually be making your head and upper back posture worse. What you need is a pillow that is in the right height and supportive of a neutral spine position. Pillows like these are often called supportive neck pillows, cervical pillows or memory foam pillows and they can do a good job at giving your head support. But before you get a fancy new pillow, you should know that as long as your head posture is not too bad you could do perfectly fine without a pillow. If you have a forward head posture/hunchback posture you should progress with gradually decreasing the pillow height. Don’t go cold turkey as this could also cause you problems. I mostly sleep without a pillow and I have done so for several years now. But I also don’t have an issue with my head posture. It is my shoulders that are the problem. People have different preferences when it comes to their sleeping position, and some interesting research that took a look at how 15,000 people slept was able to show a link between ccertain personality traits and the preferred sleeping position. In general, sleeping on the back is probably the best sleeping position for most of us in terms of both the quality of sleep and posture. But no matter whether you like to sleep on the back, side or tummy you can make some tweaks using your pillow (perhaps the old big one) to improve your posture. Sleeping on the side: Hold pillow between your knees which will relieve the hips and avoid them rotating inwards (also known as fetus position). Read more here: Laser Spine Institute. Because we are moving around all the time when we sleep without having much conscious control, this obviously has its limits for practical use. But you can at least do it until you change position while sleeping. As mentioned above, sleeping on the back is probably going to be the best sleeping position both in terms of quality of sleep and posture. It allows your head, neck, and spine to rest in a neutral position as long as you are using a big pillow and sleeping on a bad mattress. I am not saying you should stop sleeping on the side or tummy completely, but you could perhaps work on getting the majority of your sleep on the back. 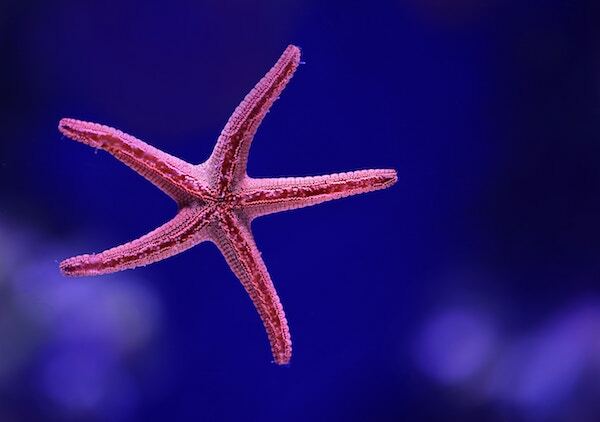 There is one specific sleeping position known as the starfish which can work great if you have rounded shoulders. Basically, when you have rounded shoulders you have way too much forwards internal rotation. Think about your upper body posture when you hold a smartphone with two hands. Your shoulders are rolling forward and inwards right? One way to counteract this is by doing the complete opposite which is an external rotation. While lying on the back, rotate your arms so they lie on the bed on each side of the head. Perhaps you will be quick to change your position when you are sleeping, but I think 10-20 minute of starfish is better than nothing. Fixing your poor posture takes time and effort. Because you it took a long time to develop it is also going to take a long time to fix it. We spend a lot of time sleeping every single day, so why not try to make your sleeping posture count towards a better posture. For the best results, you should do many things to fix your posture and it could be a good idea to buy a product to help with correcting your posture. How Long Does It Take To Correct Posture?